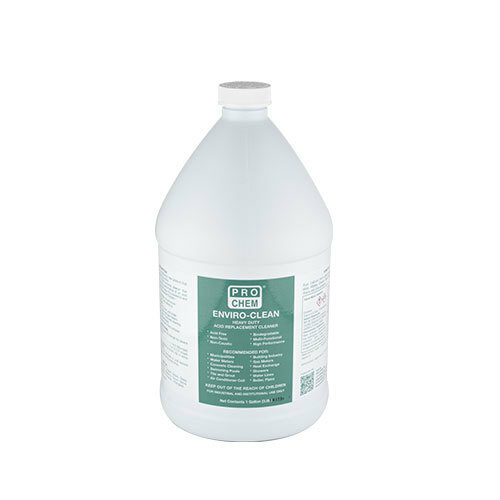 Enviro Clean | Pro Chem, Inc.
ENVIRO CLEAN is a revolutionary new formula that is a natural, safe, biodegradable, multipurpose cleaning product that combines the high cleaning performance of acids with the gentleness of liquid dish soap. It is a powerful yet completely safe all-purpose cleaner for removal of hard water scale, lime, soap, scuff marks, rust stains, grease, mildew and mold. Also, this unique acid replacement cleaner provides an unprecedented level of safety in the workplace for both the operators and surfaces – without compromising performance. Spray or squirt on surface to be treated. Let stand for a few minutes. For stubborn soils or heavy build up, agitate with brush or sponge. Wipe with cloth or swab. Rinse with water. Note: When using on chrome, test in an inconspicuous area, since not all chromes are the same grade. Also, when using on chrome and stainless steel, ENVIRO CLEAN must be rinsed immediately and thoroughly after surface is cleaned. Do not use on marble.